A fine summer evening, cool after a showery day, met the guests at a ceremony to honor Col. English at the home where he lived for over ten years after his retirement from the army in 1930. 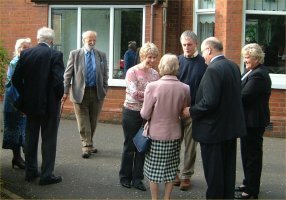 The present owners of the property, David Hopley and his family, welcomed the company and kindly provided refreshments after the formal proceedings. 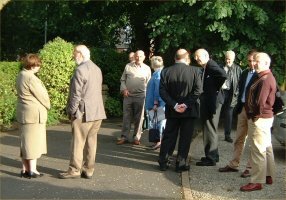 In addition to members of the Ulster History Circle, the gathering included Councillor Nelson McCausland and Olga Murtagh, Belfast Tourist Manager. 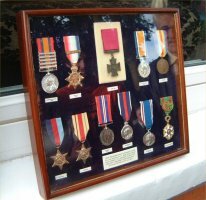 The Headmaster of Campbell College brought along Col. English’s medals (including the Victoria Cross), which had been bequeathed to the College by the Col. His daughter, Mrs Barbara McAnuff, and nephew, Gavin Bamford, were there as well as representatives of the military. 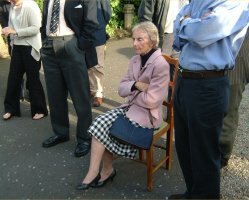 Mrs Doreen Corcoran, Chairperson of the Ulster History Circle, was pleased that members of the family were able to be here as this gave a special meaning to the event. She thanked the City Council for providing the necessary finances as the Circle was a purely voluntary group with no resources of its own. She went on to remark that Col. English, having retired in 1930, returned to uniform at the start of WW2, at age 58, a time when most men were moving into retirement. Neither was he content to serve in a support capacity but was heading to the far east on active duty when he died. Cllr. 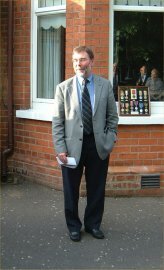 McCausland commended the Ulster History Circle for undertaking the work involved in producing the plaque. This was an important event which contributed to civic pride. 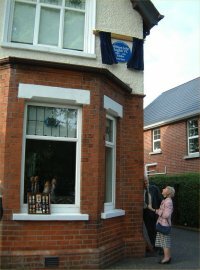 It honoured and made visible to visitors the remarkable people who lived in the city and many would be inspired by the remarkable things they had done. Gavin Bamford, Col. English’s nephew, was pleased that the Circle had taken up his suggestion for a plaque. He said that Col. English was buried in Aden where his grave could not be visited. He introduced Mrs McAnuff who would perform the ceremony. Mrs McAnuff unveiled the plaque and the company adjourned to enjoy the refreshments.